Like most Bengals fans, Rodney Perry, has been tracking the search for the new Head Coach in the Jungle, and also like most Bengals fans, he has been concerned and disgruntled about the performance of the team on the field and leadership of the franchise the last couple years. Rodney is a 43 year old, life-long Bengals fan who lives in Viper in Perry County, and spends his days working at the Whitesburg WalMart. Rodney spends his Fall Sundays following and supporting the Bengals. Rodney can remember watching Kenny Anderson and Pete Johnson throw and run in Super Bowl XVI, Boomer taking over at Quarterback, the rookie season of Ickey Woods, the jubilation of Super Bowl XXIII with the Stanford Jennings kickoff return, and then the heartbreak of Montana to Taylor to take the glory. 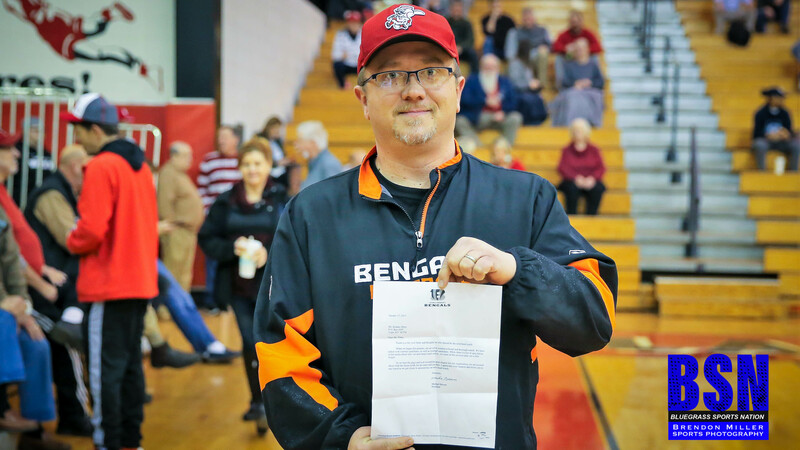 Rodney is one of the many Eastern Kentucky Bengals fans who follow our coverage here on Bluegrass Sports Nation, and contact me often throughout the season about their thoughts on the team and organization. Most other Bengals fans, like myself, also a life-long Bengals fan, 25 year season ticket holder, and now Bengals media with BSN, usually just sit back each year, murmur to ourselves and other fans, and take the decisions of the Bengals front office and not voice our concerns. Around Christmas time, and fearful that the Bengals would just keep going in mediocrity, Rodney messaged me that he was going to write a letter directly to Bengals owner, Mike Brown to express his feelings about the need for change, and the need to go outside the organization for the next Coach. Like the rest of us, Rodney was fearful that Brown would allow Marvin Lewis to stay another year, or worse, hire Hue Jackson, or stay within the organization and keep the same program and mindset. Rodney messaged me on December 24th that he had written Brown a three-page letter and was taking the extra step of sending his letter certified mail, instead of general mail. Apparently the strategy worked, as Brown, or at least someone in the front office, did receive the letter. Rodney advised Brown well, as he wrote, “Being such a fan of the Bengals, it hurts and saddens me to see the current state of the Bengals. I understand injuries were prevalent this year, but enough is enough and its time for a change.” Rodney went on, “I have worked with the public in retail since 1996. As such I expect that when I am trying to sell a product and product is not meeting expectations, it is time to revamp or redo the product. As a consumer, if I am investing my time and hard earned money in a product and that product is no longer meeting my expectations, I will not longer want to invest in said product. The product I am talking about is the Cincinnati Bengals. At this point and time, I feel like I am not getting a proper return on my investment, and I know for a fact that I am not alone.” An accurate depiction of the thoughts of many fans. Brown may have listened, as on Black Monday, the Bengals and Marvin Lewis parted ways, and since then, most of the 2018 coaching staff has been let go. Brown answered by letter dated January 17th, stating, “As we turn the page and look toward the next chapter for our organization, we are excited about what the future holds for the team and our fans. I appreciate your support and invite you to stay tuned as we get closer to announcing our new head coach.” Rodney received the letter last Thursday and messaged us with his excitement. I write this as Super Bowl LIII is being played, and it is very likely that Rams Quarterback Coach Zac Taylor will be named the Bengals Head Coach sometime tomorrow. It is an exciting time, as a new era will begin in Bengaldom, and maybe, just maybe a voice from here in Eastern Kentucky had some influence on that! WHO DEY!!! !